Last month I called a florist in Kilmarnock, Virginia, to send a bouquet to my aunt for her 85th birthday. I didn’t think twice, or even once, about where those flowers originated. 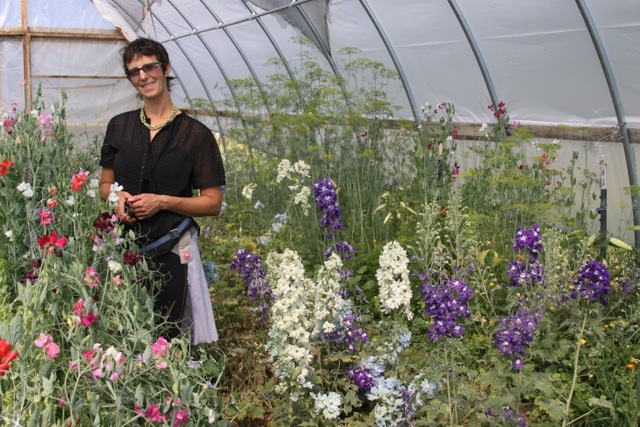 But now I’m feeling a tad guilty as I stand in the floral design workshop of Ashley Krest at Stinky Blooms Farm in Paonia, and listen to her explain her green florist approach. After greeting me in her lovely straw-bale home, Ashley has ushered me into her shop on Lamborn Mesa as she gathers bouquets and boutonnieres and prepares her “extras bucket” for delivery to a wedding in Aspen this afternoon. Extras bucket? “If you’re setting up and something has died in the car on the way, or you find you need two extra boutonnieres, or some flowers for the cake,” she explains. It’s a just-in-case bucket. Pegboard over the workbench holds copper wire, ribbons, raffia, dried flowers, and other floral design accoutrements. Shelves on the back wall hold dozens of vases and jars of all shapes and sizes, seedpods, feathers. A homemade walk-in cooler keeps buckets of flowers fresh. Now in their thirteenth year on the farm, Ashley and her husband Ted grow their own flowers organically, and deliver them across the western slope for weddings and other occasions. Ashley’s design business grows as word spreads about her intricate and ethically clean creations, many of which are pictured on her website, www.fieldflorals.com. After receiving a BA in Environmental Studies at Evergreen State College in Olympia, Washington, with an emphasis in Sustainable Agriculture, Ashley began to focus on flowers. “I definitely had a vision that I wanted to grow cut flowers,” she says. “My mom was a florist my whole life growing up in the foothills of Denver.” Her mom grew some flowers, but, like most florists, imported the bulk of her raw materials from places like Ecuador, South Africa, and Hawaii. “People don’t really think about that when they buy a bouquet,” she continues, clearly passionate about being low-impact. “They’re not eating it so they don’t really care if it’s organic, and yet the social and environmental implications…” She trails off in thought. 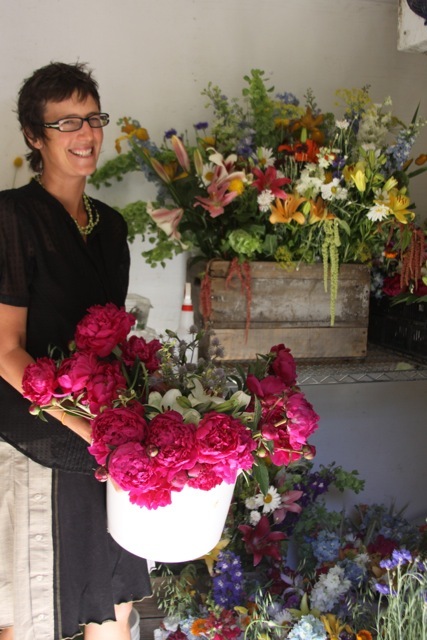 When she can’t fulfill a customer’s wishes with flowers she’s grown, she turns to other local, organic growers such as Zephyros Farm in Paonia, or for something more exotic she will buy from Denver or California. Still a smaller ecological footprint than from overseas, and only when absolutely necessary. I lived next door to the farm when I first arrived in the North Fork Valley twenty years ago. At the time it was a field of weeds with a shack inhabited by itinerant hippies, a lovely couple, a tidy hovel. After Ted and Ashley bought the land, Ted and a neighbor felled standing dead timber up in the mountains, and Ted built a beautiful timber-frame straw-bale house. Weeds were cleared for flower fields, high tunnels, Ashley’s workshop, and fruit trees. Children came along. As we stand in the shop talking, six-year-old Helena comes in with a handful of cherries she picked off one of their trees, and holds one up for me. “You grow when there’s snow,” pipes in Helena. Ashley agrees, and Helena adds, “You put snow on them.” This is one way the farm extends the sometimes meagre water available in the arid west. Their irrigation ditch is set to stop running in just a few days, and Ashley is grateful that they decided to scale back their growing this year for a respite season. 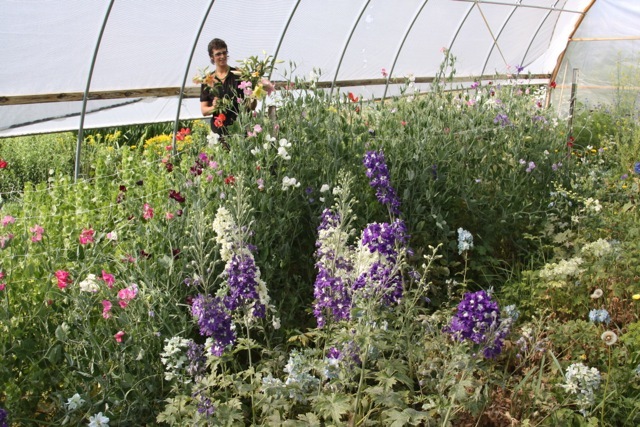 What in past years has included three fields full of flowers is now down to a few outdoor rows and two high tunnels. These large plastic-covered domed corridors resemble a greenhouse but use no added heat. Though our winters are too harsh to grow flowers in high tunnels, the growing season can be extended on the front and back ends by providing a little extra protection from the elements. After a dozen years of growing organic flowers in huge quantities, selling hand-tied bouquets at farmers’ markets and delivering flower subscriptions around the western slope, Ashley is reevaluating her work to compensation ratio this season. “I don’t really call this a business, it’s more a labor of love. If I looked at the number of hours I spend doing this… people would laugh. Anybody who thinks this is a business would just laugh, ‘cause I don’t pay myself.” Income from the flower farm helps them through the winter, but Ted’s carpentry work pays the bills. “Sustainability means making money, too,” she adds. 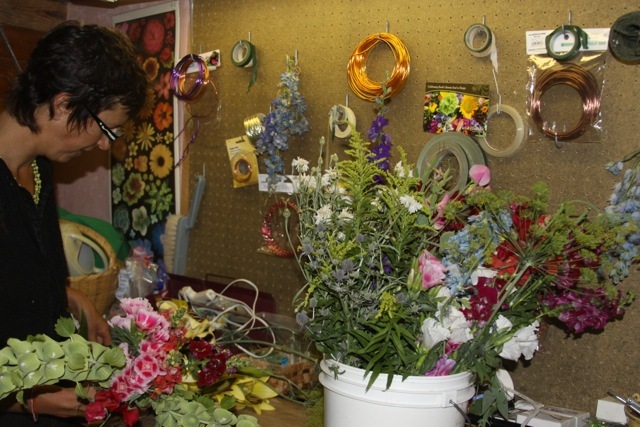 Growing fewer flowers and spending more time on the design of each bouquet, boutonniere, centerpiece, or other arrangement allows her creativity to flourish, and, she hopes, her income to increase. As she gathers the goods for the Aspen wedding, she shows me the boutonnieres she’s made for the men. Small and complex, in addition to unusual flowers they include dill, sage, and lavender. “Calming, grounding,” she says, “for the day of.” The father of the bride’s boutonniere also includes chamomile, and Ashley delights in pointing out a sweetpea tendril. In addition to the lavish larger arrangements, it is these surprising little details that make Field Florals’ designs so popular. Already dressed to work the wedding, Ashley juggles business and family as she shows me jars of flowers that will hang from hooks, urges Helena to eat breakfast, and engages eight-year-old Alyster to help with preparations. She leads me out behind the house through tall grass, formerly flower fields, saying “It’s kind of a relief to see them all in grass.” We arrive at the high tunnels, where an astounding array of blooms greets us. Ashley harvests huge lilies in pinks and yellows, marveling at the number of buds on one of the stems. “Look at that! It’s gorgeous! When it cracks like this it’s ready.” She clips and snaps off leaves, and gathers a fistful of lilies, snapdragons, bells of Ireland, several kinds of flowers whose names I don’t know, and dill. She speaks of longevity of bloom, compares permaculture to farming as apples to oranges, and cuts in half a huge grasshopper with her clippers. I confess to squishing them with my fingers when I can catch them in my garden, and we agree we’re not in this to feed these insects. As we head back to the house, Ashley points out the peony patch well past its prime. Yet she has included beautiful fresh peonies in her arrangements for this wedding. How? Peonies will store for up to a month this way. It’s fitting that we end the visit here. The scientific name of the peony is Paeonia rockii, and local lore has it that the town of Paonia got its name from a fortuitous misspelling of the genus. When I leave, I carry a jar of water full of beautiful, fragrant blossoms. “The water should be tepid with fresh cut flowers,” says Ashley. “They drink it up better than cold water.” It’s a surprise bonus at the end of a delightful interview, but I might have known. Ashley Krest is just that kind of a generous person.